Apple’s AirPort menu-bar menu is a convenient way to connect to nearby wireless networks, but it’s not without its limitations. For example, you can’t see the signal strength of each network, nor can you see which networks are open and which are protected. Last year I talked about an interesting menu-bar application, coconutWiFi ( ), which indicates which networks are protected. However, a number of users have found that using coconutWiFi adversely affects the speed of their wireless connections. In addition, you can’t use coconutWiFi to actually connect to a network; you still need Apple’s AirPort menu to do that. A better alternative is TastyApps’ WiFind 1.2 ( ; $8), which provides more information and works within Mac OS X’s own AirPort menu. Red “locked” padlock icons indicate protected networks; green “unlocked” icons indicate open networks. 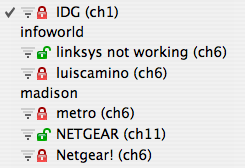 A level meter to the left of each network name shows the network’s current signal strength. In addition, as shown in the image at right, if you hold your mouse cursor over a network name, WiFind displays detailed information about that network: its numerical signal strength, network channel, security type, and MAC address. Since WiFind modifies Apple’s own menu item, the standard AirPort menu commands are still present, and you work with the menu just as you always did: choose a network to connect to it, and hold down the Option key while clicking on the menu icon to sort wireless networks in order of signal strength. You can Command+drag the menu icon to the left or right to reposition it in the menu bar; or Command+drag the menu icon off the menu bar to remove it (Network preferences’ “Show AirPort status in menu bar” option will put it back). Besides giving you these useful new features in the same menu you’ve always used, WiFind doesn’t affect network performance the way some users have found CoconutWiFi to do. I used Speakeasy’s Speed Test to test my connection before and after installing WiFind, and the results were basically identical. 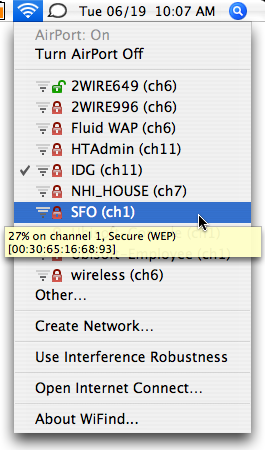 The only feature missing from WiFind that coconutWiFi has is that the latter displays the number of wireless networks in range as part of its menu-bar icon. Still, this is how Apple’s AirPort menu should work. In testing WiFind “in the wild,” my colleagues and I experienced one quirk. As illustrated in the image at right, Macworld Editorial Director Jason Snell sometimes saw networks in the menu without any signal-strength or security information. The developers are investigating this issue, although it doesn’t seem to be especially common. WiFind 1.2 requires Mac OS X 10.4 or higher.